MEC products are formulated to achieve maximum copper roughening, topography for organic adhesion, and as a replacement for mechanical or pumice scrubbing. The degree of roughening is easily controlled to create the proper surface for the application. In the case of horizontal conveyorized equipment, it is a simple matter of controlling conveyor speed. Minimum roughening for dry film adhesion promotes superior film adhesion that is required for fine line circuits of inner core material. This degree of roughening allows for clean developing and for complete resist stripping after circuitization. 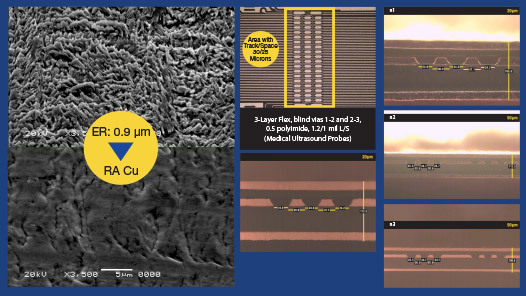 Moderate roughening is ideally suited for surface preparation before soldermask adhesion. This is particularly important to anchor soldermask dams as low as 1.0 mil thick and to prevent chemical seepage under the mask during final finish deposition. Maximum roughening is needed for inner layer adhesion. These products replace oxide treatment of the copper. Used for this purpose, the process is completed with the application of an anti-tarnish adhesion promoter. 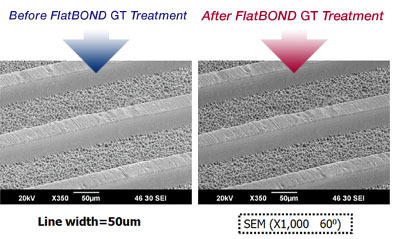 A copper surface treatment process for high frequency PCBs, FlatBOND GT provides a profile-free surface, and high adhesion performance with insulation materials. It can deliver sufficient adhesion strength for low dielectric resin, although the treated surface is flat. The photo shows the copper pattern before and after treatment. Because the copper remains unchanged, there is no signal loss. CA-5342 cleaner/degreaser removes dry film adhesive residues, fingerprints and oxides from copper surfaces without leaving organic traces. In addition, the etching component in CA-5342 can undercut and remove foreign materials from the surface. Its etch rate is lower than traditional microetchants; it is easily controlled. The Nitric acid based formulation is primarily used for copper micro roughening for dry film and soldermask applications. Apply in horizontal conveyorized mode. An organic acid-type, single-component product that provides CT-910 performance with fewer components. It is an ideal copper surface roughening treatment for use prior to resist or soldermask, with a unique surface topography that provides exceptional adhesion on resin systems. CZ-2030 has a stable etching rate, and provides maximum soldermask adhesion at a low etch (less than 40 μ inch). CZ-2030's single-component system coupled with its high copper capacity (55 g/l) reduces both storage and waste. V-Bond BO-7710 provides exceptional inner layer adhesion, as well as substantial cost and maintenance advantages compared with conventional oxide alternatives. 7710 produces superb copper topography – and is unsurpassed in adhering dry film to copper. The V-Bond process operates over a broad temperature range; dwell times can also be customized to produce specific results.